On the East Coast we have four seasons – Winter, Spring, Fall, and BBQ. We don’t need the word Summer anymore – BBQ will do just fine. And what better way to grill your favorite dishes with some of the best products that can make grilling easy. We tested several Camerons’products and are currently using them as we BBQ ribs, steaks, salmon, shrimp, burgers, corn, wings, brats and burgers on Memorial Day weekend. The skewer stick is a great way to grill seafood and assorted vegetables. 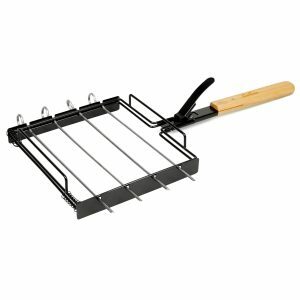 The rack has a detachable handle that allows you to place the skewer directly on the grill. This helps prevents those accidental burns on the fingers and hands. The skewer comes with a nonstick surface so it was a breeze to clean up. Purchase on Amazon and cameronsproducts.com. Retail Price: $19.99. Our favorite pan was Camerons’ Barbecue Wok. The nonstick Wok helped our vegetables just slide off the basket. However, we had one problem with the handles. The wooden handles do discolor after repeated use. We would suggest that they make the handles black in the future. But this product is far superior from others that we had used in the past because those products also took a long time to clean and eventually rusted. Purchase on Amazon and cameronsproducts.com. Retail Price: $15.99. 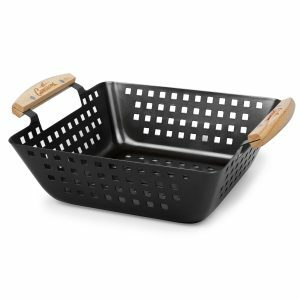 Camerons’ Corn Grilling Basket is a little difficult to lock when you place the corn cob inside, especially if the corn is quite thick. The lock is a ring that you need to slide to hold the top and bottom racks together. A little elbow grease and we got the ring to lock the racks and it was easier the second time we attempted. The nonstick surface is great for clean-up time. Corn is always difficult to cook without getting a few kernels over cooked so we strongly suggest that you monitor the corn so it does not burn and flip it over. Don’t walk away from it. We did enjoy the 9-inch rosewood handle, because it prevents your hand from getting burned. Purchase on Amazon and cameronsproducts.com. Retail Price: $12.99. We never tried grilling a pizza so this was our first attempt. 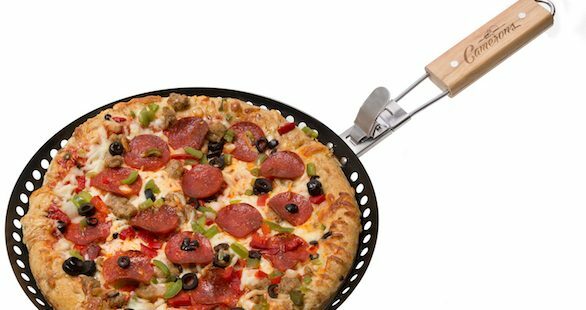 The Camerons’ Pizza Grilling pan helped us produce a tasty pepperoni pizza, but truth be told this was difficult for us to cook. The crust cooked faster than the cheese could melt so it was a little too well done in some places. But we blame this on the cook and not the pan. 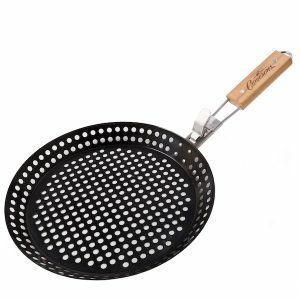 It’s also great for grilling chicken and has a handle where you can set on the grill and put the lid back on the grill. The handle does not get hot and it’s easy to serve your food. That’s the best part of this product – a heat-resistant handle. Purchase on Amazon and cameronsproducts.com. Retail Price: $14.99. And a reminder: Father’s Day is just around the corner. Dad would be pleased with these gifts.